Hurdy Gurdy | Maker: unknown. Second half 18th century. France. Also known as the vielle à roue (trans. Wheel fiddle), draailier (Dutch), Drehleier (German), ghironda, (Italian) – to name a few. 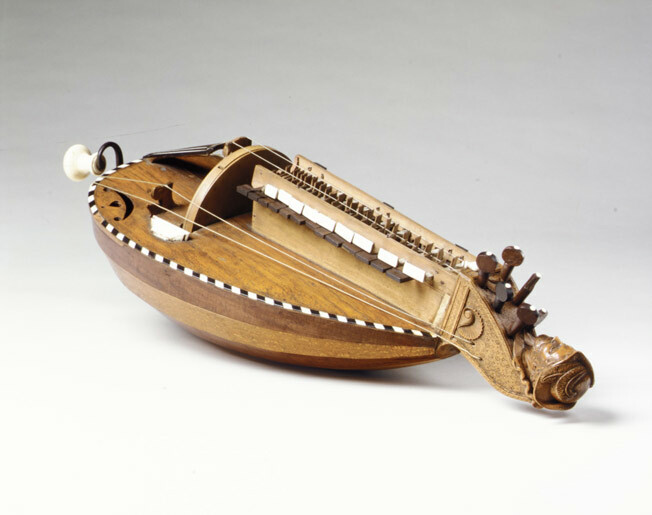 Originating in the middle-ages in Europe the hurdy-gurdy has been popular throughout Europe through the ages, particularly during the renaissance. The rich, multi-layer sound is the result of its complex construction. A stringed instrument, it produces sound by a crank-turned, rosined wheel rubbing against the strings. The wheel functions much like a violin bow, playing single notes much like a violin. Melodies are played on a keyboard that presses tangents — small wooden wedges — against one or more of the strings to change their pitch. Most hurdy-gurdys have multiple drone strings, providing a constant pitch accompaniment to the melody, producing a sound similar to that of bagpipes. A loose bridge under the drone strings creates a buzzing sound. Learn more about this instrument on a fantastic 6 minute Ted Talk “Hurdy-Gurdy for Beginners”.